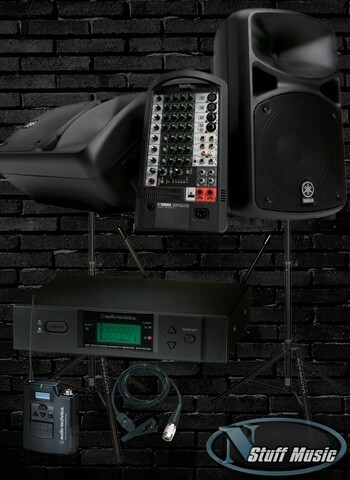 When renting from N Stuff Music you have access to a number of different rental packages we have put together to cater to whatever setup or event you might need. 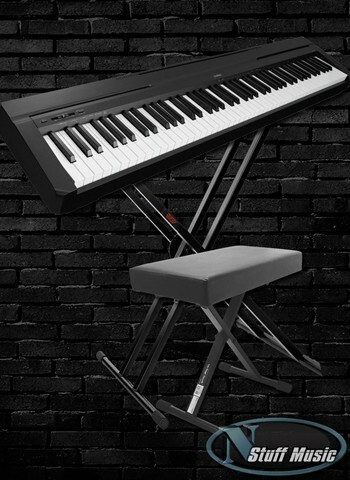 These packages are meant to fit different types of specific musical gigs, corporate events, DJ gigs, or a variety of other settings. 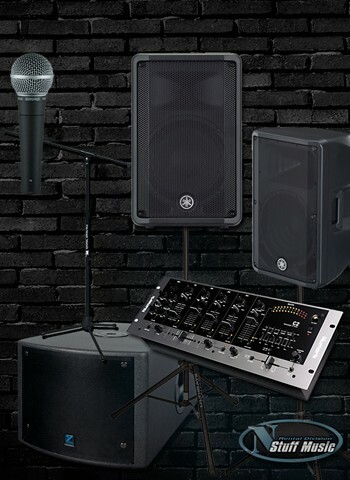 At N Stuff Music we are always in the business of making our customers’ lives as easy as possible, so if you are new to sound gear and equipment our rental packages are a great way to start. 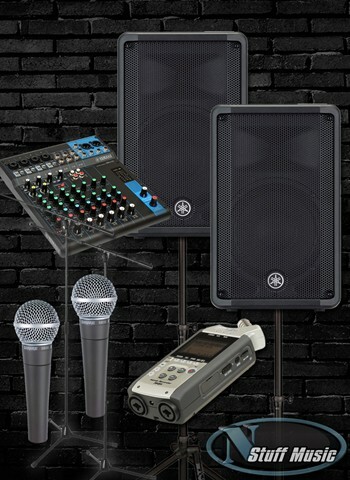 Contact us today to fill out your rental request form to reserve equipment for your event. 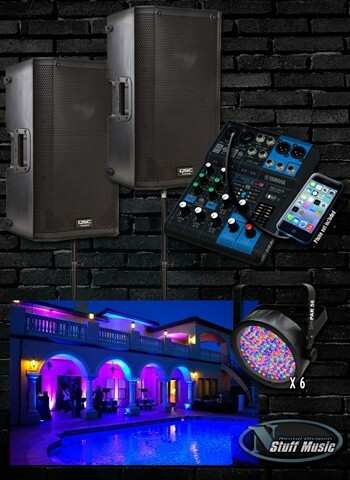 We have rental packages assembled for a wide variety of circumstances and events. These packages are not meant to be final for every setting, we are always willing to make adjustments and additions as needed depending on what you are looking for and what your event requires. 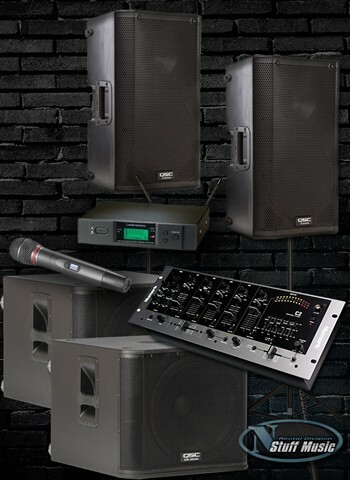 If you or your business are hosting a corporate event and need the necessary sound equipment to have speeches we’ve got you covered. Just check out one of our corporate event rental packages and you’ll find what you need. 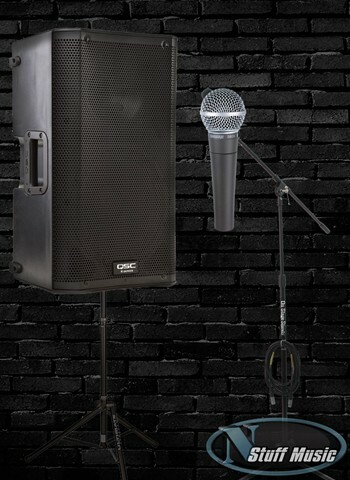 Our corporate event package 1 contains a single PA speaker and microphone so that you can be heard clearly to a small to medium audience and will not need to worry about projecting enough. 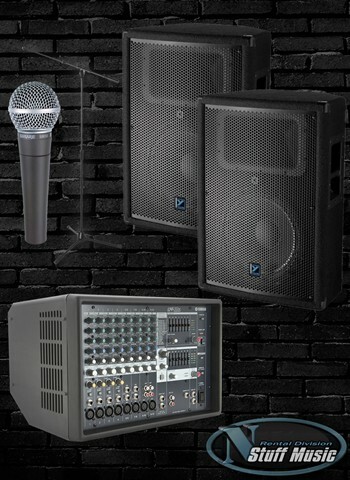 With our corporate event package 2 we have a Yamaha Stage Pass PA system with a wireless lapel microphone that will provide more volume for a larger crowd and offer you the ability to move around while talking. 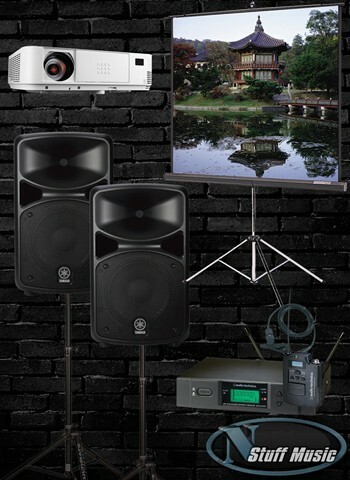 Finally, our corporate event package 3 provides a projector with a screen in addition to the Stage Pass system and a microphone to allow you to present and speak clearly with more than enough volume to the audience. 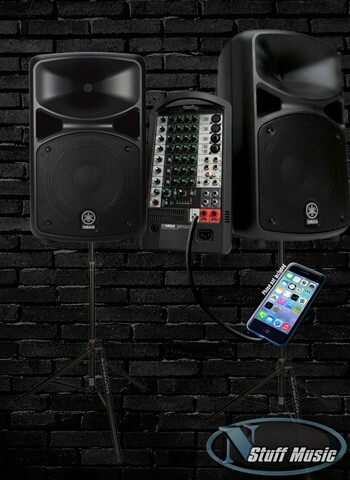 Need a system to rent for a coffeehouse-style acoustic gig? 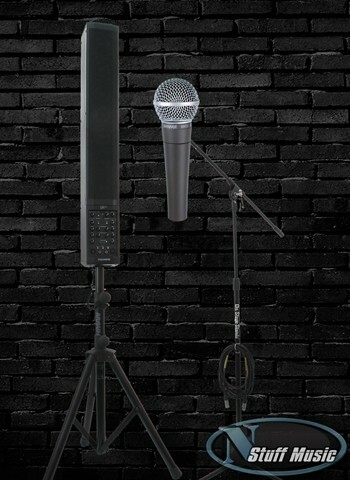 No problem, the Fishman SA220 and Shure SM58 will guarantee to give you more than enough vocal volume with clarity and also give you quality instrument amplification, not to mention how easy setup is with this! We know that for beginners to the lighting world it can be a headache to assemble a rig. 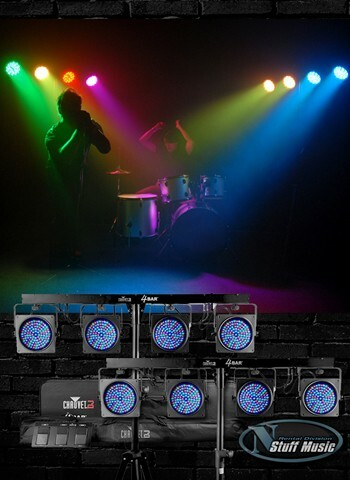 Just rent one of our band lighting packages and it’ll solve all of the headaches with lighting for you! 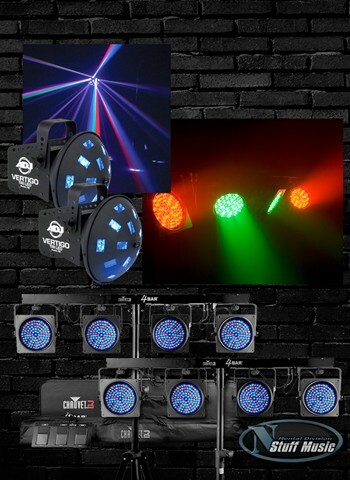 Our lighting packages range from two 4 BarUSB systems from Chauvet all the way up to a package of wash lights, strobe lights, effect lights, lasers, and haze all to bring your DJ or band experience to the next level. 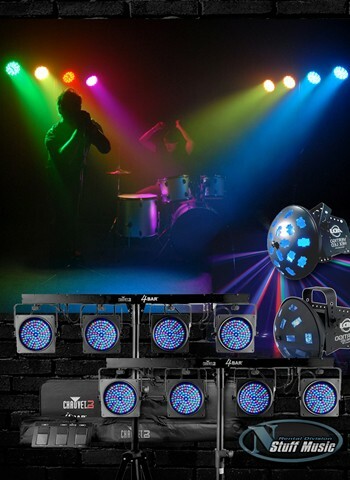 We also have simple party packages available to play music from an IPod or computer through a set of high quality speakers so you can have your favorite playlists playing for your next party. 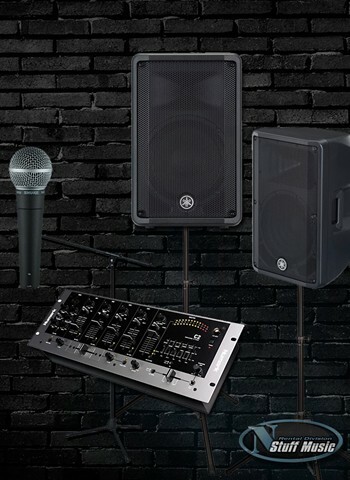 Whether you need band equipment for a rehearsal, gig, or any type of performance you can find a variety of different rental packages that will contain all of the necessary gear for your needs. 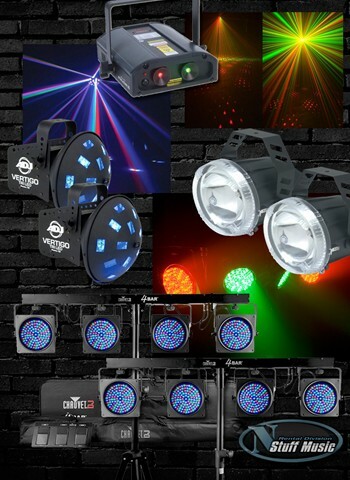 Check out our wide range of rental packages in this category and you will surely find something that suits your needs for any event with sound, lights, or other gear you would need. 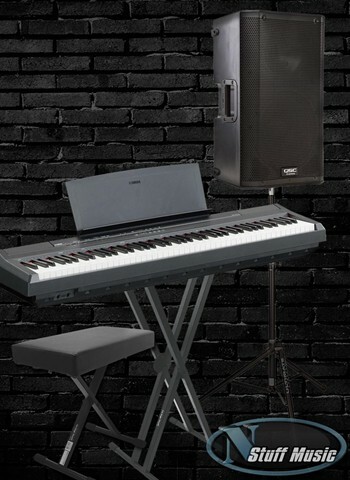 Our rental rates are incredibly affordable so you cannot go wrong with renting at N Stuff Music!